1# 12 oz Acetate 6-Flavor Sampler - Personalize your gift! What's better to let friends and family know they're being thought of during the holidays than a sampler of our gourmet-flavored pecans with your name and message? 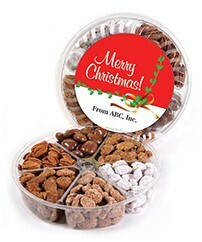 This sampler includes our original Praline Pecans, Honey Roasted Pecans, Roasted & Salted Pecans, Cinnamon Pecans, Cappuccino Pecans and delicious Chocolate Pecans. TEXT SPACE IS LIMITED ON THE LABEL, SO PLEASE MAKE YOUR PERSONALIZED MESSAGE SHORT AND SWEET!